Always a guest favorite. Spruce-up your basic egg scramble with the great taste of the Southwest. 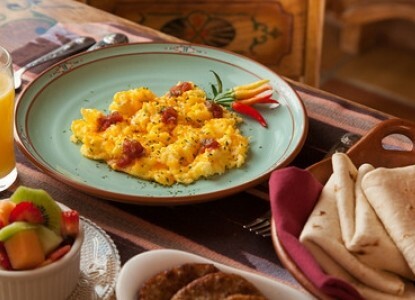 To taste Salt & Pepper 2 C – Shredded, sharp Cheddar cheese (for topping the finished eggs at the end of the cooking process) Fresh or dried Cilantro, for garnish 10 – Warm, wheat tortillas to be served as a side, with the eggs Salsa, for garnish and at the table. Sour cream, to be served at the table. 1 Cup Salsa, for garnish and at the table. Scramble the seasoned egg mixture. While the eggs are scrambling, warm the tortillas on a 350 degree griddle. Store the warm tortillas in a tortilla bowl or wrap them in a kitchen towel to keep them warm and soft until serving. When the eggs are scrambled, top them with the shredded cheese. Remove from heat. Add a lid to melt the cheese. Serve the eggs with the warm tortillas. Guests can enjoy the eggs as is or they can roll them in the warm tortillas to make breakfast burritos. Have sour cream and additional salsa available on the table. Gluten-free guests can use corn tortillas instead of wheat. Note: Napolitos are pickled cactus. They usually come in a jar and can be found in the Hispanic food section of your grocery store. Also, take care not to over-cook the tortillas. They should be warm, soft and pliable. Not hard or crisp.